MACHU PICCHU, Lake Titicaca, and Lima. Three of Peru’s most famous tourist sites. Today, though, Patrick O’Kane looks beyond these attractions and into the life of one of the country’s most famous exports – Nolberto ‘Nobby’ Solano – on this, his 44th birthday. Rewind. 20 years ago. 23-year-old Solano was carving a career in the Argentine Primera Division with Boca Juniors, playing alongside the legend that is Diego Maradona. Newcastle United were a mid-table Premier League side who had just qualified for Europe after losing the 1998 FA Cup Final to Manchester United. A fairly successful Champions League campaign had seen home wins against Barcelona and Dynamo Kiev, but ultimately Kenny Dalglish’s Toon Army crashed out in the group stage. With fresh blood needed, chairman Freddy Shepherd boarded the plane to Buenos Aires. Later in the month, Nobby Solano became the first Peruvian to play in the Premier League, a £2.5m deal negotiated. A summer of spending totalled £28.55m as Shepherd built a side ready for another Champions League football bid. Joining Solano in midfield was Bayern Munich’s Dietmar Hamann for £4.5m while Frenchmen Laurent Charvet and Stephane Guivarc’h bolstered the squad. The less said about World Cup winner Guivarc’h the better! He played just four times before being sold to Rangers. The fortunes of a young Solano were very different. A poor start to the season saw boss Dalglish depart and he was replaced by Ruud Gullit. Under the Dutch coach, Solano made his name. Making his debut on August 22, 1998, as a 67th-minute substitute against Chelsea, Solano showed early signs of his talent and by mid-September, he had earned a regular spot in the starting line up alongside Gary Speed and Temuri Ketsbaia. His first goal came in a 3-1 home win against Wimbledon on 28 November and so began a tale of respect between player and fan that continues 20 years later. Six Premier League goals, including the winner in a 4-3 triumph at Derby County, followed as Solano settled into life on Tyneside. FA Cup runners-up for the second year running and a 13th placed finish saw the Toon replicate their results from the 1997/98 season. Fewer goals were to come in the 1999/2000 season, with the right-wing midfielder contributing just three goals. But Solano offered so much more than just the end product. Gelling with Shearer, his individual flair added a fresh approach to the style of Newcastle’s play that had been lacking since the club’s second-placed league finish under Kevin Keegan. Sir Bobby Robson replaced Gullit at the helm and a bond between manager and player was created that only a musical instrument and dedication to a national team could break down. Solano’s game prospered. A set-piece specialist, Solano wasn’t the sharpest for pace, but his deft flicks and trickery lit up St James’ Park. A bolstered and rejuvenated squad saw Solano link up with Laurent Robert and Craig Bellamy and the Champions League dream became a reality as the club finished fourth in the 2001/02 season. Twelve goals for the season was Nobby’s best so far, a 90th-minute winner at Elland Road confirming the South American’s place in the travelling fans’ hearts. The 2002/03 season was the Magpies’ most successful with Solano in the side as they qualified for the second group phase of the Champions League and finished third in the Premier League behind Manchester United and Arsenal. He scored his first Champions League goal in a 3-1 home defeat to Inter but fans will fondly recall him slotting home from the penalty spot in a 1-0 derby day victory at the Stadium of Light. A cult hero in the making. As the 2003/04 season began, Solano was an adopted Geordie. Showing a passion for the game that was matched only by the shirtless fans in the Gallowgate End, Solano was not seen on the banks of the Tyne, nor the training field, without his trusty trumpet. It was eventually to be his downfall as his first stint with the club came to an end in January 2004. With Sir Bobby becoming increasingly irate at the midfield maestro’s dressing room distractions and Solano’s national team commitments, he fell out of favour. And having featured in just eight leagues games in January, he was sold to Aston Villa for £1.5m. An 18-month spell at Villa Park proved successful for Solano. Linking up with fellow South American Juan Pablo Angel, he finished the 2004/05 season as Villa’s top scorer with nine goals. David O’Leary’s men finished 10th in the league as Solano endeared himself to a new set of fans. He was voted the club’s player of the year by both players and fans but as the season drew to a close, Nobby wanted to go home – and a return to Newcastle was on the cards. Throughout the season, former teammates kept in touch with him and despite a Liverpool bid to sign him, the Peruvian opted to go back to St James’ Park in a £1.5m deal. Graeme Souness’ signed him in the dying hours of the transfer window and it gave Solano a new dawn with Newcastle. Back where he belonged, Solano was soon pulling the strings in midfield again. Just six goals to his name in his first season back, but the winner against Arsenal, a special free kick against North East rivals Middlesbrough and a brace against Everton in a 2-0 win kept the pressure off him. Midway through the 2006/07 season, Solano’s versatility was tested when Stephen Carr was injured. Adaptable and working for the team goal, Nobby agreed and slotted in at right-back. Having started his career in defence, it was not an unfamiliar role for him and he kept his composure to help Newcastle to 13th place in the Premier League. Despite having signed a one-year contract extension, Solano moved to West Ham United in August 2007, having requested a transfer for family reasons. His spells on Tyneside amounted to 230 games, with a return of 37 goals. And if there’s anything a Newcastle fan will tell you, those goals were special. 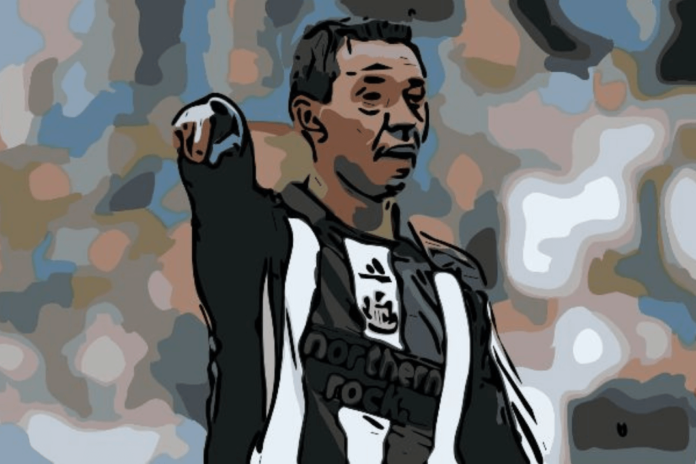 Nolberto Solano doesn’t do tap-ins. From awkward-angled headers to half-volleys, free kicks and thunderbolts, he had it all in his locker. Despite going on to play for Leicester City and Hull City, he later returned to the North East where he played briefly with Hartlepool United. He took a coaching role at Newcastle Benfield in 2012 but by May he had returned to his native Peru. Earlier this year, Solano, as assistant coach to Ricardo Garera, guided Peru to their first World Cup since 1982. They recorded 1-0 losses to both Denmark and France and exited the World Cup at the group stage despite winning 2-0 against Australia on matchday three. One thing is for sure though, Solano will always have a place to stay in Newcastle, should the need arise. “He brought flair, composure and that little bit of class when needed! The way he just settled into the team and the city, he was instantly adopted. He was the first Peruvian to score in the Premier League and he seemed like a true professional. “A personal highlight of Nobby would be his goal against Everton where he feigns the shot and deliciously places the ball with the outside of his foot. His goal against Liverpool was an absolute rocket and the volley against Leeds was Shearer-esque. “Welcoming a player back with the quality that Nobby had was always going to be easy. He showed the same passion and professionalism which the fans understood and appreciated. Hi, I'm Patrick O'Kane. My alter ego is sportingpat, almost for as long as my beloved Nottingham Forest have been outside the Premier League. I am 34 and currently live in Altrincham, Greater Manchester.